Looking for an amazing fly in fishing experience in Alaska? The Alaska Sportsman’s Lodges is the perfect place for any angler looking to do some Alaskan river fishing. Our guests have the rare privilege to battle for the famous and elusive Alaska salmon as bald eagles soar through the pristine crystal blue sky above them. We offer 5-star luxury services and all inclusive fishing packages that cater to the unique needs of our clients. The Alaska Sportsman’s Lodges offer unforgettable wilderness adventures that are custom designed just for you. We are the top luxury resort for any sportsman or sportswoman looking for the best Alaska fly in fishing. Imagine sharing the waters of the American River with the famous brown bears of the Alaska frontier. These bears are more interested in the salmon than you are, and will amble peacefully by you as they scour the rushing waters for their lunch. No other Alaska fishing lodge can offer the exciting and exceptional guided fly fishing trips that we can. Experience an Alaskan riving fishing trip to remember under the expert care of one of our world-renowned fishing guides. Our guests get the opportunity to safely enjoy the best of both worlds: trophy sized salmon and rare encounters with these giants of the wilderness. Our guides are experts on fishing these pristine rivers, and they would love to share the mystery and wilds of Alaska with you. If you want a brown bear viewing experience that surpasses any opportunity provided by the traditional viewing tours, either one of the Alaska fishing lodges we own are the place to be. Let us lead you on an adventure that will take you right into the heart of the American River where you can come face to face with these Alaskan leviathans. Our guests get to steal exhilarating moments as they walk up the river with brown bears lumbering only a few feet away on both sides. The bears are so close that you could reach out and touch them if you dared! Other Alaska fishing lodges cannot hold a candle to the Alaskan Sportsman’s Lodge when it comes to river fly fishing. We are proud to help our guests map out their own daily adventures and we are happy to make any Alaskan wilderness dream come true. 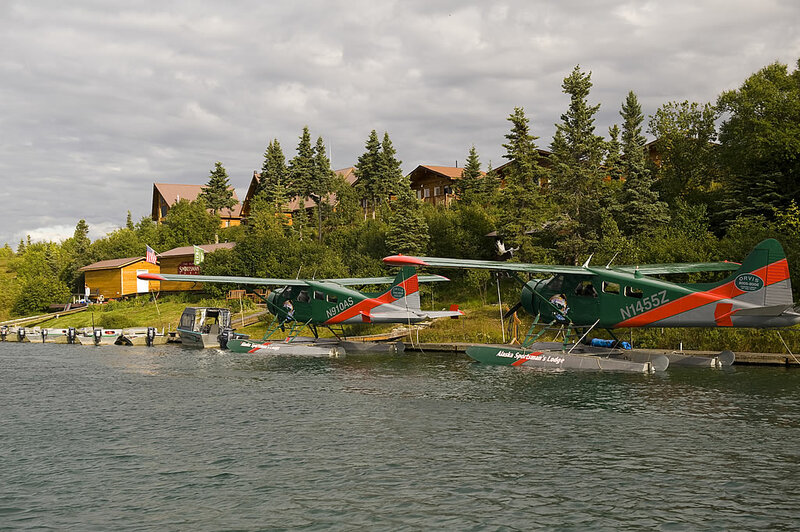 Whether you would like to fish, hike, or view the breathtaking scenery of Katmai National Park from the comfort of one our private planes, we are here to meet your needs. Whatever daily activities our guests choose, we guarantee to deliver the fun and the unforgettable memories!